Claim a Fragment of Wuuthrad from Dustman's Cairn. After completing one Radiant Quest, talk to Skjor. Team up with Farkas and travel to Dustman's Cairn. Locate a Fragment of Wuuthrad. Participate in your own initiation. After successfully completing Take Up Arms and any one of the radiant quests, speaking to most any Companion member will point you towards Skjor for your next major assignment. Skjor will reveal that a scholar has discovered another fragment of the legendary battleaxe, Wuuthrad. He asks you to retrieve it and will direct you to Farkas who will serve as your Shield-Brother for the task, both helping you survive the quest and supervising you to ensure you complete the mission "honorably". When approached, Farkas becomes a temporary follower. If you already have a follower, he or she will return to your home or to his or her base location and await you there until you've completed the quest. If asked, Farkas will elaborate on the origins of Wuuthrad. Your destination is Dustman's Cairn, a barrow northwest of Whiterun. You can either have him follow you all the way or ask him to meet you there. The place is crawling with draugr, so be prepared for a long trek. There is a Two-handed skill book The Battle of Sancre Tor in the first room. The second chamber contains an arcane enchanter and two thrones, with the only available path blocked by a gate. Locate the northernmost room and pull the lever, which will drop another gate and trap you inside, after which the lever will break. From the other side, Farkas leaves to find a way to release you, but instead is unexpectedly confronted by a group of Silver Hand members, leaving you trapped to watch the scene unfold. The Silver Hand turns out to be there for a reason. While you watch, Farkas will transform into a werewolf and wipe out the opposition within seconds. After opening the gate, Farkas will reveal that only certain Companion members are blessed with the ability. Proceed forward through the linear cave system until you reach the entrance to the second zone, Dustman's Crypt. After continuing through the next door, you will cross the bridge where you can see the lower room you are headed towards. If you stand idle in this caged walkway, at least one archer will attack you from the room below. After crossing the bridge, you will go around a corner and be in a long down-sloped hallway. 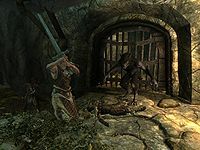 If you run ahead to attack the Silver Hand, or choose to follow Farkas, a few draugr will awaken from the crypts lining the walls and attack you from behind. Make your way through the crypt and fight all Silver Hand members and draugr. In the large chamber under the bridge, open the chest for the Dustman's Cairn Key and unlock the door to the north. A few skeevers will attack in the next tunnel. When you reach an alchemy lab, head east and fight the residing frostbite spiders, then head downstream using the small bridges and face the draugr. Follow the linear path through the catacombs and open the iron door. The chamber ahead appears quiet at first, but the many sealed alcoves and coffins should hint at what to expect. Loot the many minor containers for treasure, then follow the map marker to the altar where the Fragment of Wuuthrad rests. Approach the word wall behind the altar to learn one of the words for the Fire Breath dragon shout. Finally, pick up the fragment and prepare as numerous draugr burst out of the coffins to attack you and Farkas. Additionally, the iron door will now be locked, preventing any strategic backtracking. After the battle, a path will open from the balcony above, so make your way to a tunnel initially inaccessible in the first zone, which will land you back near the entrance to Skyrim. Back in Whiterun, you will find Vilkas waiting for you just outside Jorrvaskr. He will then lead you around the building where the entire group of Companions will be gathered. Guild head Kodlak Whitemane will give a short speech and welcome you to the Companions, while Farkas will swear eternal loyalty to you. You are now an official member of the Companions, but will have to complete yet another radiant quest before your next major assignment. You will also be able to buy Skyforge Steel weapons from Eorlund Gray-Mane from now on, and he will give you one Skyforge Steel weapon of your choice for free. Farkas, like many other followers, is incapable of sneaking properly. This makes this quest tougher for sneaky players. 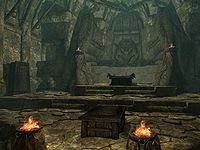 The draugr in the closed tombs lining the walls of the final room can be killed off before picking up the fragment, making the final battle much easier. First Silver Hand: "Which one is that?" Second Silver Hand: "It doesn't matter. He wears that armor, he dies." This is ironic, since Farkas is the only male member of the Circle who is not wearing the Wolf Armor of the Companions. Version 1.2 of the Unofficial Skyrim Patch changes his outfit to Wolf Armor. If you have already learned the first two words of Fire Breath, the Word Wall may contain a word you already know. At one point, it was intended that either Farkas or Aela could accompany you, but this was changed to Farkas only before the game was released (see this section for details). Farkas can be a crippling liability because of his defective class specification. Regardless of level, he has 15 Heavy Armor and 25 Two-Handed, rendering him useless at higher levels. When Farkas transforms into a werewolf, he drops his Skyforge Steel Greatsword, and has to use a noticeably weaker iron one instead. Although you can't trade items with him, you can still fix this by simply putting him into command mode (target him and hold Activate until the cursor changes) then targeting the sword or a Silver Great Sword and pressing Activate again. The Skyforge Sword will do a little more damage against human enemies, but the Silver Sword will do considerably more damage against the swarms of draugr in the word wall room. This transformation also causes him to level up correctly in his class, increasing his health by several hundred points at higher levels: his skills will still be broken, but it does make him capable of surviving a few more hits. After pulling the lever and getting trapped behind the gate, the game may freeze at the point when Farkas is supposed to transform into a werewolf and then free you. Reloading an earlier save and entering the location again may work. Use the Console command disable followed by enable to get him unstuck. Hitting Farkas with Unrelenting Force before triggering the lever may put him in a position where he is able to overcome the freeze. While inside the locked alcove trap, Farkas may not help you. This can be caused due to a Draugr being in Farkas' detect enemy range. After trapping yourself, go into the Console and enter tai, next enter tfc, exit console mode, follow the tunnel until you encounter the first Draugr, enter Console mode and click on the Draugr, enter kill 1a693, either click the Draugr again or double click on any object to clear the reference, enter tfc, enter tai, leave Console mode. Farkas should now kill the Silver Hand fighter, return to human form, and go throw the release lever. He may simply return to an earlier part of the dungeon and stay there, not realizing you are trapped. This seems more likely to happen if you have brought another follower with you. Reload an earlier save, return to the switch-trap alcove, and just outside of it do prid 1a693 then moveto player in the Console, then go flip the switch while he's still within visual range. He may nevertheless take some time to notice you are trapped (perhaps a minute) and trigger the werewolf scene. This tip and the above one can be combined (in reverse order), to first return him to the right area, then to trigger the werewolf scene if he just stands around or leaves again. 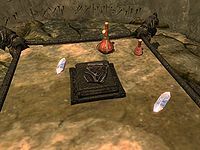 Alternatively, restart outside Dustman's Cairn, leave any other followers outside, enter with Farkas, and ensure you kill all Draugr on your way to the switch-trap alcove (many are slumbering in their wall niches) and try again. Make sure Farkas is in the room with this alcove before you throw the trap switch. Another option is to use tcl in the Console (click first until you are highlighting nothing in the Console at all, or the command won't work) to escape the trap, and just go do the rest of the dungeon by yourself. You'll need to fight your way through a number of Silver Hand, but the undead at the end can simply be run away from, if you get your Fire Breath shout off the wall, and the fragment of Wuuthrad. It is the taking of the latter that triggers the fight, so you can explore and plunder the area and discover the exit tunnel before taking that item (doing so is also what locks the original entranceway. Farkas may not stand up from a crouching position, even if you do. This only appears to happen after Farkas transforms into a werewolf. Or he may remain in werewolf form, emitting werewolf breathing sounds, but return to talking as a human. This will fix itself after a cell transition, e.g. to the inner crypt or back out again. ? There is a chance the leveled enemies in Dustman's Cairn will not generate at your current level. 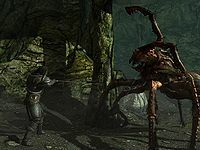 At low levels you may fight regular and Restless Draugr throughout most of the dungeon, but may unexpectedly be swarmed by Draugr Scourges and Deathlords in the word wall room, easily overwhelming you and Farkas. When returning to Whiterun and taking place in the ceremony inducting you into the Companions, the other participants in the ceremony may stop talking, causing the quest to not complete. Using the Wait command for one hour after the dialog stops unfreezes the companions and completes the quest. Commit a minor crime in front of a guard, such as punching an NPC, before the ceremony begins. Afterwards, a guard will confront you about your crime, allowing you to leave by being taken to jail. Once you serve your jail time or escape, return to Jorrvaskr and talk to Kodlak to complete the quest. When returning to Whiterun and taking place in the ceremony inducting you into the Companions, some of the other participants in the ceremony may not be in place and therefore the cutscene will not activate. Stand in the general area of the gathering (the sparring area) and use the Console to bring the missing NPCs to you (Vilkas should be summoned last because he actually starts the cutscene). First use prid <RefID> then moveto player. The RefIDs for the Companions are: Farkas (0001A693), Skjor (0001A691), Aela (0001A697), Kodlak (0001A68F), Vilkas (0001A695). The game might get stuck after you follow Vilkas to the meeting. When returning to Whiterun and taking place in the ceremony inducting you into the Companions, if you have Automove active when the cutscene starts, you may continue to move during the cutscene. ? Vilkas may not appear in front of Jorrvaskr and the game won't give you the objective Follow Vilkas. You don't need to activate this objective to finish the quest. To fix this, go into Jorrvaskr and talk to him and he will give you the objective. 200 Finishes quest I successfully retrieved a fragment of Wuuthrad, the Blade of Ysgramor, to earn my place in the Companions. On the PC, it is possible to use the console to advance through the quest by entering setstage C01 stage, where stage is the number of the stage you wish to complete. It is not possible to un-complete (i.e. go back) quest stages, but it is possible to clear all stages of the quest using resetquest C01. This page was last modified on 10 March 2019, at 23:35.